This is the one essay about rowing, and though I make brief comment elsewhere about it, this is the one occasion I have written —and at length. I have written quite a lot about running [17, ] hashing  and hillwalking [135 ], but not about, say, hockey or squash. 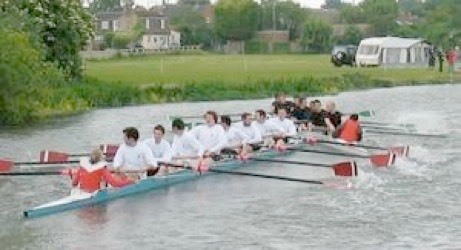 My last week in the UK is raised in excitement by an invitation to row in the Town Bumps in Cambridge. I last did this in 1975, when the City crew - of which I rowed ‘at three’ - was head of the River in a delight-filled year of success. We had our picture in the evening news at least twice; once for the bump on Rob Roy on the first night, and once later in the week, where the huge length of clear water behind the boat just showed (allegedly) what a fine year we were having. Unfortunately I also remember that we lost the regatta race on the Saturday because we were so used to rowing 2000 metres that we really couldn’t shorten up for a 500m dash. This year will be a much lower crew, City VI in the third division. Being a load of old fogies I don’t expect it will be at all successful, as our age will betray us over both the short and the very long distances. Being a scratch crew we won’t have the usual advantage of style over substance and I foresee an expensive week with a general descent into senescence (is that originally sine sense? Without sense due to decrepitude? Would then senility be a contraction of sine ability? Surely not!). The Bumps occur in Oxford and in Cambridge, both Town and Gown. In Oxford, the Town Bumps is a small affair, unlike the College Bumps. 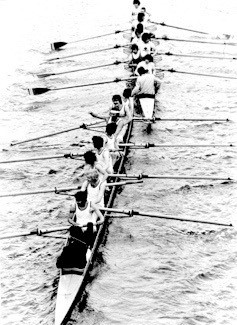 The principle of bumping races is that eights, some 60 feet long, with eight oarsmen and a cox each, line up along the bank, each cox holding a bungee (or bung) fixed to the bank at intervals of about two and a half lengths, so some 90 feet between boats. Boats line up in groups of up to eighteen at a time, called a division. On hearing the cannon (literally, a small cannon), all hell breaks loose as the boats compete for a suitably swift start and attempt to catch the boat in front. Should some prevail in this, those two boats fall out of the race while everyone else continues. Thus in general, adjacent pairs cease to take part. On occasion, a really fast crew will catch the boat three in front of them, through the gap created by an earlier bump; this is called an overbump. A double overbump causes a rise of six places. The next day the crews all return in their new positions to race all over again, for four days in total. Depending on location, the order of the divisions trends to better (faster, lower numbers) or worse. 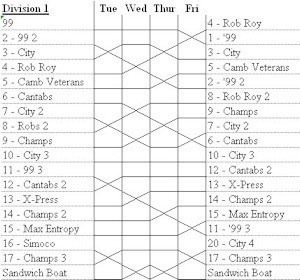 If worse, the bottom boat in a division must turn around to race in the next, lower division, generally as easy meat for the best crew in that lower (meaning worse) division. Thus the advantage is given to the better crews and one might view the design as one of failure rather than success. The other way around means that the top boat of a division ‘rows over’ or bumps and then must race again almost immediately in the hope of catching the rear of the next division. This way rewards excellence. Crews which rise four or more places earn an oar, or ‘win blades’, often literally so, for the club will give them an oar with their successes painted on the face of the blade and at college, a “bump supper” will be given. The same accolade is given to the crew which rises to “head of the river”. i.e. first in the top division. When I did this in Oxford, the process of bumping was costly, particularly in the lower divisions where less skill was (not) balanced against enthusiasm and the result was expensive damage to boats. In my first year, 1972, I was in a poor crew1 which went down every day so thoroughly that the colliding boat would ride up across our riggers and break off the front of the(ir) boat. We were rowing a clinker-built affair (overlapping strakes of timber, not a ‘shell’ of veneer or fibreglass) and so we were both heavy and tough. Which describes the boat, not the crew. Brother Colin has an entry in the Guinness Book of Records for going down more places than any other crew. Claiming a bump on day one, they were denied, for the boat they had bumped was itself awarded a bump on the crew in front of them. Colin’s boat was trapped against the bank and as the argument about who did what to who (this was long before road rage and oh so politely done), being 1975-7) raged while the rest of the division went by. This meant some twelve places were lost. And for the next three days they went down again, losing fifteen places. Bumping became so expensive in boat repair that the form of a bump changed and crews yielded if there were sufficient overlap, only making the bump physically when a cox refused to yield. I remember 1974 particularly when the cox (from Yale or Harvard) of Brasenose One (BNC1) successfully kept the crew behind (Keble 1 maybe) by ‘washing off’, a process whereby each time the hunting bow is close enough to the defending rudder, a quick flick of the rudder causes the bow to sweep by, missing the intended target and also pushing the chase boat off course. Thus the two boats weave sine waves as they travel upstream, with the chasing crew describing ever larger curves. Brasenose One kept this up all week, a remarkable feat made all the sweeter for the lack of tactical change from the predators; if a definitely better crew, they should have been able to establish a significant overlap in cleaner water and sweep across for a definite bump from the advantage of, say, a third of a length. From the spectator’s point of view this is one form of rowing which is visibly sport and visually exciting. Even if you know no crews, it is a spectacle of itself. If you do recognise the colours of a club, by the painting on the blades and by the backs of the crew, then it becomes as exciting as soccer on a good day. Water is splashed everywhere at the start; both rivers have twists and turns in the early part of the course, offering all sorts of advantage to be gained or lost, and (Oxford comma) this means that the confusion creates even more spectacle. It is quite possible to have crunches reminiscent of Formula One. Bear in mind that these craft are 20 metres long, contain eight sweaty, meaty people easily exceeding half a tonne between them. They can reach working speed in ten strokes (and most of that in the first five), and stop inside their own length. Full pace is about the same as a good club runner, some ten miles an hour. The river is barely wider than a boat is long and care must be taken in choosing where to turn round. The ‘gut’ in Oxford is wider than the turns on the Cam, but the Long Reach on the Cam is much wider and longer than the equivalent Reach on the Thames in Oxford, known as the Isis (though I think properly the Isis is the tributary not often rowed upon). The water of the two rivers is also different. If you have used an ergo (rowing machine) then you will know about the damper on the fan. At the top setting you pull harder for each stroke; at the bottom you end up rushing up and down the slide and must take care to row less evenly. This is equivalent to moving aerated water. The Cam is short of air, the Isis more aerated and the Thames in London so frothy that a quite different style is required. In terms of technique then, the Cam allows time to get hold of the water and gives the potential for very long strokes, leaving the feeling that the blade barely moved through the water and more that the boat pivoted around the blade tips, rather reminiscent of the pirate’s jolly-boat in Peter Pan. The Thames provides less resistance, so the stroke itself is swifter as the blade moves a greater distance through the water; one consequence is that the opposing slide ‘forwards’, needs to be consciously slowed down. On an ergo this can be explored relatively easily: the stroke rating (strokes per minute) in the display’s top right corner can usually come down without loss of power (set to watts, or watch your time for 500m). There is an optimum slow stroke rate at which you can keep a given rate of work up. This is called taking “time on the slide”. It is easy to experiment and see that rushing up and down the slide at a faster rate does not improve the measured boat speed. It is common for boats to be rating at 36 when the same actual speed could be achieved at 28 (strokes per minute). Yet it is difficult in the heat of a race not to think that more strokes means faster on the water. It is true that a faster stroke means a faster boat; the trick is to time the next stroke to optimum effect. A tyro in a boat and in the gym is easily spotted: they take just as long in both directions on the slide. Much of rowing is about teamwork; the physics models say that the interference of one oarsmen on his fellows subtracts a great deal of the work done, so a weaker rower may actually make the boat go faster and hence you have a demand for what are called ‘seat races’, where two alternative oarsmen are placed in the boat for a test distance. It is curious how sometimes, unconsciously, one rows more vigorously with a different colleague. I was never aware of deliberately trying harder or not for a special combination of crew, whereas I was always aware of an opinion of the difference. The concept of forwards and backwards in rowing is akin to the confusion about in and out in cricket. “the team that is in goes out; the other team puts people in until they are all out at which point the team that is all out is in. Each player that is out comes in” and so on. In rowing you face the back of the boat, the stern. The bow is the sharper end at the front. Only the cox faces forwards, and the crew face him (or her, for ladies are generally lighter) because pulling is more effective than pushing. All the confusion comes when considering motion within the boat, where forward on the slide means towards the cox, and so externally seen as backwards. One doesn’t refer to the other direction, for that is part of the great essential, the stroke. I have heard it said that rowing is the pursuit of the perfect stroke. It is assumed then that those who have retired did that at least once. Lucky people. Outside the boat one is concerned largely about obstacles and relative position. The crew are supposed to take no notice, to follow blindly what the cox says and to simply be the engine. In practice oarsmen are usually older than the cox, often with significantly greater experience and a dreadful tendency to think for themselves. A good cox gains their trust and respect and can take initiative before the crew decides to do things for themselves. This is generally a good thing, for on the water when things go wrong they do so rather suddenly. (i) Side by side in twos or more is the general form of a regatta, with the winners going forward to the next round in a knockout and sometimes a race-off for losers (a repechage) that either results in an entry to the later rounds, or to a ‘plate’ consolation race. This gives many crews enough races to justify the effort and cost of attendance. Courses are almost universally straight, a famous exception being the Boat Race. Big events race on specially prepared (built) eight lane courses. This causes much complaint about inequality of lane draw for two reasons; (a) boats are sensitive to wind and this is rarely even across such a width of water and (b) crews are sensitive to wash upsetting their balance so it is (considered) important to seed races around the central lane. Which of these two factors is greater is the root of much consideration and largely irrelevant conjecture. (ii) Chasing in a line is the general form of a course race, where boats are started at precisely timed intervals and the finishing times give (eventually) a race order. This has several advantages: the (lack of) width of the river precludes side by side racing; overtaking becomes rare, an issue and a skill; courses are far more interesting; the way a crew deals with corners and the placement of the current can dramatically affect their results. (iii) running several races concurrently, such as in the bumps where races are held on adjacent days or such as a league, where times and positions from previous events are juggled to minimise overtaking requirements. What seems so simple in the gym is anything but when the boat is rocking, bucking and twisting - in navy speak, demonstrating roll, pitch and yaw. Actually, while an eight rolls frequently it twists within its own length more than it yaws. Thus the platform for rowing is not stable except in the very best of crews. Keeping your blade free of the clutches of the water while between strokes becomes something of an issue for the novice oarsman and remains an issue for the experienced, who are concentrating far more on putting some work on the blade while it is in (and supposed to be in) the water. This picture of a bump, takeken from Oxford’s archives, [http://archive.comlab.ox.ac.uk/other/rowing/bump.html]shows an element I have not yet discussed, that each oarsman has only one oar. If you have rowed yourself this is so obvious it didn’t need stating, but for those that have not tried it, there is no clue in the gym that there might be a bias. Generally the oar is around 16 feet long (a rod, pole or perch is 16ft6inches and this may be significant), with a collar about a third of the way along so that the shorter end is inboard and might be considered as handle, while the longer length is outside of the ‘gate’ (the pivot outside the boat attached to the ‘rigger’), and might be considered the blade. Really the blade is either the whole or the flatter piece at the end. Generally one tries to get only the face of the blade immersed. One also feathers the blade between strokes, that is, one turns the flat of the blade so that it runs parallel to the water between strokes, thus reducing air resistance (dramatically). Having just one blade is quite enough in a boat of this size. Blades to the right of you are called ‘stroke’ and to the left are called ‘bow’, in both cases after the guy at an end who rows that way. Few oarsmen can row on either side (I can’t write ’both’ without even more confusion), which is a pity as the repeated exercise builds up the chest unevenly. A fit, practising, single-sided oarsman has a stripe of well-defined muscle running diagonally across his chest from the outside operating arm to the opposing hip. The two hands do different tasks as the outside hand will be perceived to be pulling harder and so the inside hand is used for the feathering process while the outer hand may even have the thumb on the top of the handle so as to avoid scoring a groove in the thigh on the way forwards. I ought to explain about starts. In any race one needs to accelerate up to working speed; rowing is not different, except that the demand for teamwork means that the process needs to be practised. Generally the habit is three short strokes, ten longer strokes, and then settle at whatever the crew’s racing pace is. The gradations of paddling are Light, Half Pressure, Firm and Row. At BNC we had Panic above Row and kept that for the moments when a bump was about to happen. It didn’t stop us being bumped. Look at wikipedia; http://en.wikipedia.org/wiki/Sport_rowing for general coverage of rowing, at http://en.wikipedia.org/wiki/Bumps_race and at http://archive.museophile.org/rowing/bumps.html for descriptions of bumping. I read none of these while writing this and so apologise not at all for discrepancies. I think the wikipedia rowing coverage is excellent. 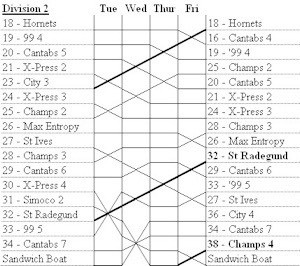 The whole week’s results are at http://www.cra-online.net/bumps/results/2007/index.htm and at the bottom of this. 1 Let us be clear, I was definitely one of the poor in a poor crew. that night, six would row on the Tuesday. rowing training, Mark, a fit young guy well in with the club, clearly able and well and rowing with some class. Belongs in the 2nd VIII, but work at Peterhouse took him away from rowing for a while and cost him his place: at seven. His stroke is a lot longer than everyone else’s, so either he has a problem with the ends of the stroke (slow hands) or he is reaching places we no longer can – or he isn’t pulling at all hard, which I don’t believe. Alun, nearing sixty and still rowing on salt water, travelling from Stevenage, some 30 miles away; fit, able and enthusiastic. Very Welsh. At five on Monday and six on Tuesday. Ed, the instigator, rows stroke side from preference, lives and works in Cambridge, but suffering from some breathing problems. Begins the evening at stroke, ends at two and sits out on Tuesday. Steve, a big big guy, missing from Monday but present on Tuesday. At five, if only because he must be edging seventeen stone. Tom, Ed’s brother, based in Nottingham and very keen. An expensive week for him. Rowed at four. Marcus from Florida, not far from Tampa (“no hurricanes for forty years”). Looking fit if a little overweight, at three. Tony, the President, missing Monday but rowing Tuesday; clearly well, runs his own business, a tight ship and rows with class, at two. Myself at bow, living in Cambridge hotel (Ineffective Invective) on the way to emigrating. By comparison, fit and elderly. Alun is lighter, fitter for rowing - and even older. Monday’s outing - how exciting it is to rediscover basic skills. Some trepidation at the outset, realising just how very long it is since last I pulled a single blade (1977) although sculling up until 1983. Only ‘rowing’ since then has been in the gym. Paddled up to the Long Reach, very much further than I remembered, using only six of the eight and using the other two to keep the boat balanced. One suspects that this is as much for assurance as anything else. I had forgotten too just how narrow the river is. Tuesday included eating at 1530 to ease the dining problem, since one returned to rooms at 2030 Monday. Paddling up to the start was not only a long way, it was crowded with issues and other boats. Happy to have everyone else do the worrying. We did several three-stroke starts, deciding to try less hard and therefore, we hope, have more success. Picking places to do demo starts of three and ten, or as cox put it, until whenever (like disaster, the other sort of stroke, etc), we certainly pleased the crowd and ourselves, since it felt strong, stable and collected. The process of rowing, repeated heavy pressure, is perfect for building blisters rather than calluses. Further, if this is one of the costs of the week, it is freely paid. The others are having similar problems and I noticed Tom and Marcus dealing with their hands in much the same way. I would have expected to run all the way to the boathouse, but surprise myself by walking (to conserve energy, I tell myself) in both directions. I am finding myself easily winded, which is either nerves or bad diet or there is some ageing process of which I am in denial. I had been back to running before this week, but would admit that times for my regular 30 minute run were at seconds over 31, not the preferred sub-29 mark. Returning to fitness is hard and becomes harder with advancing years – something I have been saying wryly for the last twenty years. What follows as description may well not be borne out by the results declared at the bottom of the script. I note also that these results are unstable, in that I seem to have copied them several times and that they fail to reproduce on some screens / systems. Apologies, though the whys and solutions are beyond my comprehension. However, it is an accurate record of what I perceived and was told and in that sense relays the confusion attached to the whole affair. Don’t spoil the story by cutting to the bottom, unless you intend to read no more of this (noun deleted). Tuesday. So we go to the start. We arrived at our station first on the bank by virtue of our starting practice(s), so got out of the boat and stood around on the bank. Thus we were last into a boat, after the four minute gun. Our ‘bank party’, there to help us push off and raise (oars) at the last minute, was very competent, and we pushed off from the bank at 25 seconds to go, were ready with less than ten seconds to go, “touch it bow” in the last three seconds and there’s the cannon and off we go. Behind us on the river is City 7, a novice crew keen to demonstrate ability over senility and they pull a quarter length off us in the first twenty strokes. However our banksman is yelling that we are with a length of Express 5 in front and keeps on calling the distances. We have settled to something fast and strong; one can feel the experience and it is just a matter of time before the body starts to fight against the memories of how to do this. I can feel the third minute is going to be horrible as the banksman calls the ¼ length – and suddenly there’s something at my elbow and we’re holding the boat hard and worrying abut clearing the river for City 7 to go by. A veritable bump in the classic manner. The banksman is accused of underselling the distance, but says his ¼ was right, just that we surged once he said it (or they folded). Exciting, profitable, worthwhile, exhilarating. All of these. Prospects immediately for the morrow are that City 7 will catch Express 5 long before anyone gets near us. We can hope that another crew comes down towards us so that we don’t have City 7 chasing us again this week. The prospect of ‘rowing over’ is not attractive to this crew; we quite dread it. I can see that we would make decisions about survival and while we would attempt an overbump if available, only mediocre (not poor) crews can be overbumped, and we are probably not that good. Therefore rowing over is a bad thing both for that night and the next. Picture of an early bump from 2003 College rowing, taken from the net. Actual contact has been made, potentially expensive; the crew making the bump are ‘holding hard’ to slow the boat down, but not effectively, from the picture. The bumped crew are in all sorts of difficulty and both crews need to get out of the way of the rest of the division, though this is on the Long Reach, which is quite wide. We won’t know until Wednesday quite what happened to City 7. We think we passed them against the bank in the Long Reach as we went slowly back to the boathouse. That could be evidence that they had rowed over (didn’t see another crew go past us) or that they had overbumped, which would leave us in the lurch. My hands are in a bit of a state, but that is hardly surprising. Middle finger of outside hand (the right) has blistered and punctured during that first outing. Blister kit to the fore, bought in Enfield (where planning on selling the car at seriously less than anticipated). Sticking plaster as cushion for Tuesday wore off by the end of the outing and discarded. Left hand has sore at base of little finger where the oar hits the greatest angle to the hands, dealt with similarly overnight. Weds a.m. shows another sore patch at the first phalange of the right middle. Regular rowing builds up the skin to tolerate this wear and I am having trouble believing my hands are so very soft. Day Two (Wednesday). Behind is the crew we caught last night, who (let’s face it) had a bad start, but City 7 should catch them, being not much different in standard from ourselves. In front of us is Cantabridgian 9 (big number = successful club) who rowed over last night. And in front of them are numbers 5 & 6 of the same club, where 6 caught 5 last night after a dreadful start from 5, the crew briefly in front. This start is more constricted in the angle of a bend, which might explain last night’s relatively easy row. A little thought by Gareth, the banksman and we see that I need to start with my blade almost in the bank, but with stroke end further out; it feels all wrong but it should work. Tony (whose crew it is, being President) has this plan; we row like stink for the first two minutes – a minute longer than we’re capable of – and then if we are overbumped, at least we know we can catch the crew from last night all over again…. From the gun it is clear that nothing behind is going to trouble us, and we pass two pairs of crews against the bank as we come to the first of the pair of corners leading into the Long Reach. Being a gloomy and windy evening, we really don’t want to race into the wind, assuming that our durability is poor relative to any other crew, but the yelling from the bank as we go around the first corner is that we are holding at one length. Not what one wants to hear, but we have made a half length. The shouting doubles in the first corner as they go wide and we do significantly better and then, as we turn the other way, I can hear the shouting saying they’re going wide. Now, last night, the wake from the boat in front was in the water immediately beside me. Tonight I cannot see it, but if they’re going wide on this second corner it must be to my left; there is nothing in the way of disturbed water between the boat and the end of my blade, but there is something further out… By the time I register this, another five strokes, maybe, the cry from the bank is that “They’re not going to make it”, immediately followed by “They’ve hit”, and a heart-felt “Oh, f**k” from one of the stroke side fellows. Being a bow side corner, the right thing for Two (especially) to do is back off (even in extremis) and save himself for the last, stroke side, corner where a little extra pulling will make a big difference to their success. So we are given the bump by virtue of overtaking. It somehow doesn’t have quite the same fairy-tale feeling as Tuesday, probably because it was hurting so much. None of us wanted to row over (do the whole course without stopping) and we really don’t want to be bumped. At the same time we are very well aware that at our vast age, application of care and attention to detail will have more effect than brute strength and that reliance upon basic fitness would be totally erroneous – although in truth we are each individually quite good for our age, nevertheless we don’t compare well with the crews around us. So a long long paddle back to the boathouse, flirting with crew number 39 (to our 45) who are clearly stronger and keener *(and turn out to be another Cantabs crew, so maybe with something to prove besides their bump of the evening. Meanwhile it transpires (back in the bar) that in front of us whoever’s 5 caught their companion 6 crew, and in front of them City 5, who rowed over on Tuesday, gained a bump. This means that tomorrow we are chasing Whoever 6 and Whoever 5 can expect to catch the crew coming downwards. This is looking good for Friday, but tomorrow looks difficult. As Bob said on the landing stage, whoever is writing the script for the week is going a damn fine job of it. Meanwhile City Ladies 1, who began at 3rd on Tuesday and gained the desired bump, got to within two feet of Cantabridgian 1 tonight but was (were, if the crew is plural) held off successfully. Everyone says, “There’s always tomorrow”, but those of us that have been in that position, both pursuer and chased, know exactly how it feels. The challenge is psychological as much as physical and the battle begins anew tomorrow; the problem is to not let last night’s efforts have any effect. This is one occasion where the history doesn’t help. Going to Head of the River is a wonderful feeling (been there, done that, living off the proceeds still) and one wishes the girls the very best. From the point of the crew being chased, if you’re good enough for Head then there should be a significant gap of clear water between you and the second crew: if they get within a canvas then you are not deserving of the title and will eventually be caught. And that is what bumping is about. As with all pursuit racing, the mind-set is quite as contributive a factor to success and failure as the physical nature of the challenge. As far as the club goes, City 2 (Men) was bumped. That’s the first ‘failure’ of the week for the club. Ourselves and Cantabridgians appear (so far) to having a fine time of it. But that is in the nature of the event, for one or two better oarspersons displace people downwards, so that the relative improvement is right across the board, and all crews are seen to succeed. Similarly, where a low-numbered crew is short and steals a player from elsewhere, all those other crews suffer. That seems not to be the case here, as there are several potential oarsmen available for a single evening but not the whole week. For a team sport that is not a particular strength, but it is just possible that with sufficient experience the usual negative effects of a change within a crew are cancelled out. We will see, particularly as Tony himself will not be available on Friday, since he is to be in Derby at 15:00. Day Three; Thursday. Rain fell from the heavens from 1530 to 1630 and then is blessedly cleared up. We realise that the usual chaining, where crews going down meet crews going up, may fail us tonight, as although the two crews in front, Thames Champions (Champs) 5 & 6 have swapped places twice so far, the crew in front of them has rowed over. This suggests that Champs 5 may not catch tonight’s ‘Whoever’, who in turn are chasing City 5 and City expects to catch the veteran crew in front of them. So we have to catch crew number 42, Champs 6 and do that before other bumps take place. We began the week at start position eleven in our division, so are now on nine. Position Ten was nettled, but we make good enough time yet again up the river that, nettles or no, we are getting onto the bank for a stretch before racing. All very cool, collected, maybe even concentrated. Our start and whatever in front of the Plough felt extremely good. The crew we are chasing are of extremes of age, but we are unsure if that informs us of anything. The guns are exactly 24 hours later than the previous nights, and our start – brinksmanship enacted – leaves seven’s blade just clear of the bank as the gun goes. So into the frenetic rowing, blowing hard right from the start (having forgotten to breathe at all in the practice start earlier). Good power and last night’s bump is charging towards us, looking closer than they should be. Loads of shouting apparently saying we are inside a length (already?) but now ‘on station’, meaning keeping that interval. Two pairs of crews are into the bank, adding to the cheering us on and we go into the first corner, a right pull for bow side. The course Russell picks brings the gap down and another crew higher up the division has left a boat on the meadow side just beginning to drift away from the bank in the wind. Panting very loud, struggling to hear at all well, see that the drifting boat is really very close to collision with us and our blades, not realising that the cox of our target crew has been clouted on the arm by one of the blades of that (not quite) stationary craft. The exhilaration of making a bump does not make for good decisions in terms of the races of others. I realise that the boat chasing us has just been bumped, which means we are safe from behind, and the noise from all around suggests we are very close. I see that the wash of our quarry is on my right, so even closer to the bank of the left turn than we would choose and I am wondering just how much longer this must go on before they yield. Then I can see the rudder level with my rigger and Tony at two is shouting to hold it hard. The poor girl could not raise her hand to yield and her stroke was not thinking at all well, so we only just rescued the boat from damage. The captured cox is in tears, which we mistake for distress at getting her coxing wrong and learned differently (about her arm) from Ed on the bank very much later. Obviously we needed to clear the river route for other crews and we did so swiftly. Unlike the previous night, this felt like a bump we really had to work for and we recognised, over too many beers in the bar that night, that we were lucky that the crews around us bumped early. So Friday leaves us assuming that we shall be chasing the Whoever that Champs 5 caught tonight; it is not clear which of the crews in front of us rowed over, but we were aware that the sandwich boat way behind us, rowing for the second time that night, got an exhilarating bump in the Long Reach (so two long rows in one evening), which excuses them another row over. It is hard indeed to row at the head of a low division, for if you have pretensions (of going up to the next division), you expect to row the whole course avoiding bumping and only after that do you have the chance to catch a crew at the bottom of the next division up. A hard test, indeed. For us, the prospect of the possibility of blades is exciting. each one of the crew is cautious not to count chickens, for each night has not quite produced the race we expected and we are sorely aware that the races of those around us are creating the opportunities for our success quite as much as we are ourselves. Clearly Russell is worth at least half a length plus another quarter length per corner. He says himself he is only interested in coxing where there are corners to work on and he gave me a discourse on the habits of the college coxes (and how they differ with him on best route). He seems to have the right of it in our current company. We are without Tony on Friday and his seat will be filled by Tony Duffy. I hope he is up for this. The prospect of not quite getting the four bumps, hence the blade that Tom has never won (nor Mark, I expect) is depressing and stimulating at the same time. It is the risk of one’s reputation that gives the thrill and that repute, that standing, is as much of one with oneself as between self and others. After all, who really cares? Just the crew; so it is the crew that one is working for, the crew that is rewarded by success. We are entirely sanguine about not succeeding, for we know we will try as hard as our failing bodies will let us. We know we have had an unreasonably good week already and not making the fourth bump would not subtract. At the same time, making the four would put a fairytale ending on a week which, as Tony put it again, is so well scripted it should be on the telly. And excuses me for rambling onto my ninth page in Word. The girls were bumped and are back at position three on the river. Overall City has had more success than any other club (but Friday may well change that). Late news in the bar was that Rob Roy (their 1st VIII) have been disqualified for not declaring an outside rower (who has been sharing effort among four clubs) – a task easily fixed by a simple declaration at the start of the week. 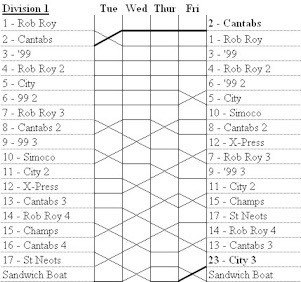 The scuttlebutt is that they are dropped back to sixth for fielding an illegal crew, which means that the crew which became Head of the River tonight will on the last night be behind City 1, which has rowed over every night so far. If the decision stands, then that will likely cost a bump against City. Fifth on the river is the lowest you can reasonably expect to reach the head from, since overbumping is rare in the good divisions (four bumps, one per night, captures Head on the last night). Imagine the cockiness of a crew that deliberately holds back from a bump so as to go for an overbump; that requires extreme confidence in ability – and not a little trust in the muttering that passes for perception of form. Furthermore, the understanding of form is only trustworthy in the better (lower-numbered, later) divisions, where (always, necessarily) the differences in crews is relatively small. It is one thing to go for overbumps when such is the only option available, but to choose to avoid the simple, straightforward bump so as to go for the bigger success – well, that takes unbelievable confidence. Thus if upheld, Rob Roy will want the bump up to fifth. Clearly, being the only crew that has been making progress at the top of division one, they can be expected to catch whoever they choose. For those looking at general club progress and really valuing the overall success prize, this is a disaster quite on a par with the girls’ loss tonight. Friday; the final night. Study of the results for the week suggests that we have been supplying City 7 with catchable fodder since getting away from them on Tuesday. They should catch Champs 6 tonight and make space behind us. In front, we have Champs 5 (who, it turns out, rowed over), a descending veteran crew and City 5 chasing another crew steadily descending. The whole of the division in front of us separates into ascending and descending pairs. Worse, the whole division has behaved that way all week, with the rare exceptions rowing over. 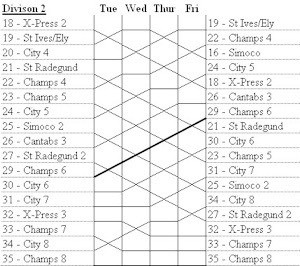 By escaping the clutches of City 7 on Tuesday we forced them to row over; last night Champs 5 had that dubious honour and it looks as though that may fall to us tonight. However, that doesn’t change our strategy, which must remain starting just as hard as we can in the hope of catching Champs before they catch the Veterans. Honestly this is not likely, because Champs policy has to be exactly the same; get the bump before they are caught by us. They know we can catch them, it is only a question of how much distance we need in which to do it. The muttering about Rob Roy is clarified with reasonable debate and the fuss about not declaring crews is resolved as having been a clerical error – the declaration was made, just not recorded in the regatta results. Or so the relevant people are persuaded. So, to the row: Champs actually get away from us at the start, if briefly and we haul them back to inside a length before they catch the Veterans. By Grassy (the first bend), City 5 have caught Radegund, City 7 catch Champs 6 somewhere similar, but that is out of sight to us as we are already into the next corner, and the only crew left to chase is eight places in front, at the head of the division and already facing two rows in the evening. As we drag ourselves past the Plough (the last named point before turning into the reach) we realise the state of play, so the only thing to do is look to see the size of the gap. It is huge; they are basically out of sight. As we tidy up our rowing and settle to steady, conservative rowing rather than the race state we have used for the rest of the week, it is equally clear that the space behind us is also huge. So this is to ‘row over’. It means we are easily first back at the boathouses, first changed and first in the bar; a mixed blessing. When editing this in 2012, I saw a confusion in the results. I think I have left this correctly sorted out. When I left the bar on Thursday night, no other boathouse was still open. This night, one other was. Alun went to see if he had friends in Nines (99s, next door), and came back saying it was like a morgue. Some well-dressed elderly bloke with an effective tannoy dragged everyone on the bank to our boathouse to explain and award the cups. Head of the River twice (bigger tankards than mine of the same name, I noticed) to Cantabs (men) and Rob Roy (women) and the Jenner Trophy, presented for the last six years and awarded to the club with the highest total number of bumps (ups less downs) divided by the number of crews. So this is likely to go to the newest, lowest club on the river - and it has, for all but one of the years. The gossip had registered that of the bigger clubs, Champs and ourselves had been doing well, but the bias towards the small clubs meant no-one had taken a lot of notice until earlier tonight. 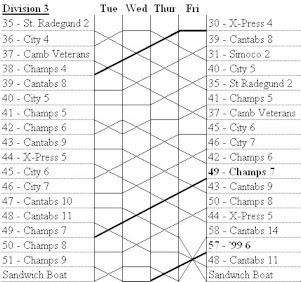 Nevertheless, the silver-haired gent says, it goes to a large club this year who, despite having 17 crews on the river, still had the best score by some margin: City. I have put the published figures somewhere here. Now that was a cause for jubilation. It is a very large, very nice cup and we made sure we captured ourselves digitally with it. Not that I have a copy, but that is what happens with pictures. The party went on well past midnight, and so it should. The same script-writer that went for the oh-so-exciting middle of the week clearly decided to go for the sequel, keeping the tension up. He maybe doesn’t understand that next year, the crews won’t be the same. It may be that the veteran crew left in front will be as relatively bad next year, but there are no guarantees, not even that, should we to wish to row again, we would be crew number 6. The labelling of the crew depends on the perceptions of skill and ability taken on a basis of almost nothing and more nearly, in our case, what is left over when all the other crews are placed in what feels like the right place. Such is rowing.